The readings for this Sunday focus on family relationships – something we may be particularly aware of in the aftermath of the recent World Meeting of Families. The first reading is the Genesis account of the creation of male and female, which indicates their equality and the sacredness of their union in marriage. The gospel is Mark’s account of Jesus’ reply to the Pharisees’ questioning about divorce. It goes on with Jesus embracing children and blessing them. 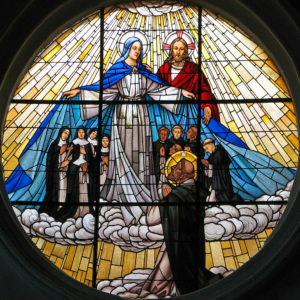 In our Dominican calendar, however, today celebrates the Solemnity of Our Lady of the Rosary. The rosary had its origin not with St. Dominic but in the Dominican Order, which is not surprising because originally it was associated with preaching. Over the centuries the rosary has become a very popular, very specific ‘standardised’ prayer. Originally it was a way of praying rather than a set prayer – a way of praying with scripture. The vocal prayers are there simply to measure a time of reflection – the whole point is reflection on the mystery. 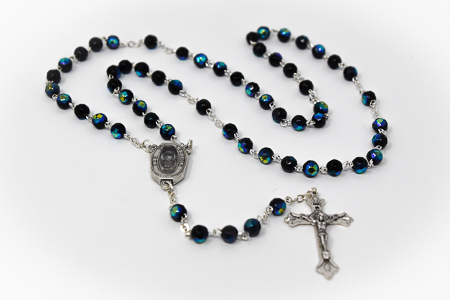 Perhaps the ideal way of praying the rosary is that practised in many places, where each mystery is introduced with a reading/recital of part of the gospel account of the mystery. (The somewhat questionable ‘Fatima’ prayer could well be omitted. It does not really belong)) In private recitation, perhaps we could make a definite pause before each decade and recall some words from the relevant scripture. . Because the rosary is so familiar and the prayers so repetitive, it is all too easy for it to become mechanical, not just externally but internally. When the rosary was standardised, fifteen ‘mysteries’ were chosen – from the infancy narratives, the Passion, and the Resurrection/Glorification. This clearly left a very significant gap since it skipped the whole body of the gospels – all the events, actions and teachings of Jesus’ public life and ministry. Recently this has been corrected to some extent by the introduction of the ‘Mysteries of L ight’ or ‘Luminous Mysteries.’ – the Baptism, marriage feast at Cana, proclamation of the Kingdom, Transfiguration, institution of the Eucharist. This is a great enrichment. Some might like to be creative and use the form of the rosary to reflect on their own chosen mysteries as well e.g. the Samartan women at the well, the cure of the blind man, the call of the Twelve, the raising of Lazarus (with Martha’s great act of faith), the woman anointing Jesus at Bethany ( Jesus said what she did would be remembered.) Or one might explore some of Jesus’ parables. So many possibilities!